What does running mean to you? Pain, success, goals, distaste? Nothing excites me more than asking someone this question and seeing their eyes suddenly light up–it’s like flipping a light switch. For myself and others who love to run, it means so much more to us than can be described in one casual encounter. After much deliberation I compiled a playlist to help elaborate on my feelings towards running. My favorite part of running is running late in the evening, so I settled on a playlist that emphasizes the feelings I mostly associate with running at night. Hopefully it can help others understand why myself, and so many like me do what we do. Enjoy! Running is for letting go. Running is a journey, which starts with the first step! “Slow Motion” helps to calm my stride and let go of the stresses and trials of life as I embark upon my evening run. Running is for story-telling. While running alone at night is an experience in and of itself, running with friends is a perfect time to tell stories. “Taro” is a story told with mystery and exotic grandeur. 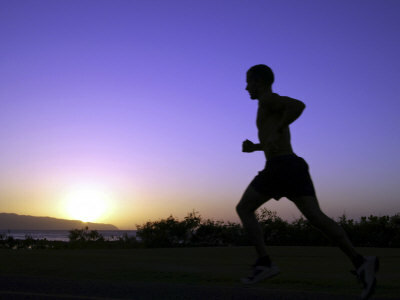 Running is for tuning out distractions, and refocusing. The fast-paced rhythms of this track mixed with the surreal tones and mystical vocals of Justin Vernon make it a perfect fit for evening running. Imagine the wind rushing through the pines as you pass them by. Running is a time when I like to think. “In Your Arms” is both reflective and thought-provoking: it allows me to reminisce and pursue my own mind to the track’s laid-back storytelling. Running is for experiencing the world. If you’re ever running along a beach at night, this song will blend seamlessly with the sound of the waves crashing against the shoreline. It is both peaceful and powerful and makes me feel weightless in the ocean breeze. Running is for pushing hard till the end. “The Funeral” starts off right when I’m feeling the rush of the final minutes of a run. The closing instrumental is a powerful finish to any run and pushes me to fly along with it as I power into my last strides.